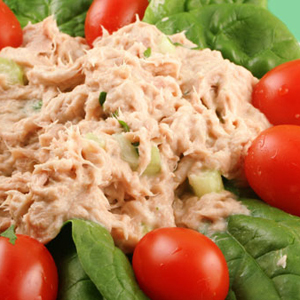 Tuna salad is a quick low-carb, low-fat snack or lunch option that can be made ahead of time so you can grab and go. Place onion in a small bowl and cover with cold water. Refrigerate for 20 minutes. Drain. Whisk mayonnaise, salt and pepper in a medium bowl. Add tuna, celery, tarragon and onion; stir to combine. Serve on top of the lettuce (or mixed greens) with tomato and lemon wedges. This entry was posted in Entrees, Salad, Seafood and tagged celery, easy, fast, fish, fresh fish, healthy, metabolic diet recipes, Metabolic Medical Center Recipes, tarragon, tuna salad by foodies4mmc. Bookmark the permalink.